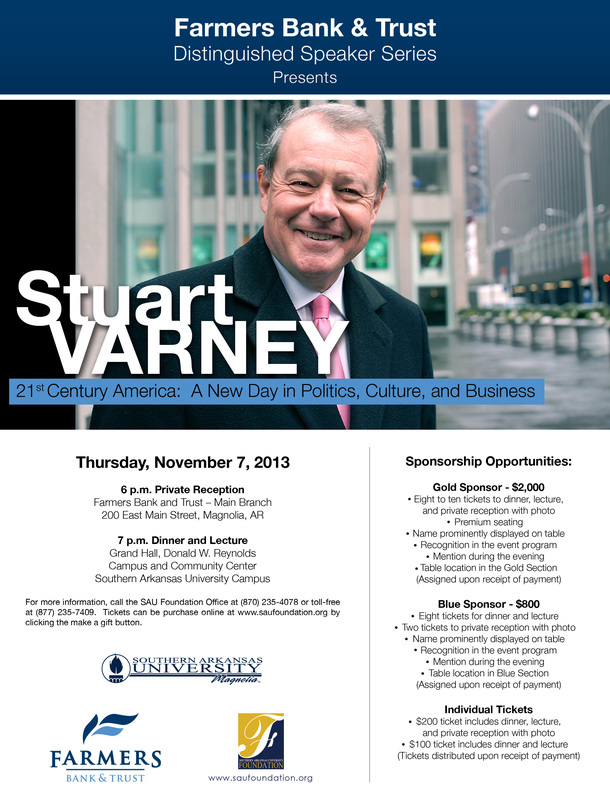 MAGNOLIA – Fox News Channel’s Stuart Varney is scheduled to present at the Ninth Annual Farmers Bank and Trust Distinguished Speaker Series on November 7, 2013 at Southern Arkansas University. Tickets for the event are now on sale. 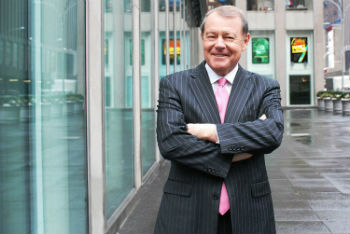 Varney’s topic will be “21st Century America: A New Day in Politics, Culture, and Business.” He anchors “Varney & Company” on the Fox Business Network, and appears regularly with Sean Hannity, Bill O’Reilly, and Megyn Kelly, among others. Proceeds from the event provide scholarships to students who possess the talent, energy, and intellectual curiosity to access higher education but lack the financial resources. A private reception with Varney will be held at 6 p.m. at the Farmers Bank & Trust main branch in Magnolia. The dinner and lecture follow at 7 p.m. in the Grand Hall of the Donald W. Reynolds Campus and Community Center at SAU. Tickets start at $100 for the dinner and lecture, and are $200 for the dinner, lecture, the private reception and an autographed photo with Varney. An economist educated at the London School of Economics, Varney is uniquely qualified to address the rapidly shifting domestic and global economic trends, and the implications for business, institutional investors, and individuals. His exceptional coverage and analysis of the stock market crash of 1987 earned him a Peabody Award for excellence in journalism. For business to prosper, it must address economic issues impacting its ability to compete. Varney cuts through the jargon to make complex economic issues accessible and interesting for any audience. No discussion about the economy is complete without consideration of the political climate and the economic agenda of the current administration. Varney’s frank assessment of worldwide politics as it relates to economic trends, opportunities, and hazards is fresh, insightful, and comprehensive. For more information, Click Here or call the SAU Foundation Office at (870) 235-4078 or toll-free at (877) 235-7409. Tickets can be purchased online by Clicking Here.